Looking at the picture of the R211 side panel has me thinking those are going to be some of the narrowest side windows on a post-WW2 subway car fleet we’ll see. They have to be due to the wide entry doors. This really bugs me. The windows keep getting smaller. Why? There's enough above-ground trackage that customers certainly would appreciate a little light and a view. The MTA should care. Wy can't we have modern plug-style doors that allow double the windows, instead of huge, opaque door pockets? I think the should get R160’s instead, those who ride the do not deserve luxury, yet. Leave the R211 in wealthy neighborhoods. and perhaps? Did you not read the beginning of my post? Only person who would say something like that and mean it is Flushing Express. *DISCLAIMER* THIS IS ALL JUST SPECULATION!! If all R211’s (from Option 1 only) arrive plus the 2 additional Open Gangway Trains, they should be prioritized on the and first since the has very high ridership and the is the Short version of the . For a period of time, they might share R32’s, R46’s, R179’s, R211’s, (and maybe R42’s). Keep in mind that this is just speculation. So plenty of R160’s should be on the in the near future. I highly doubt the / will get these first. If the swap to make the / fully NTT with R160s doesn't happen by 2020, then they will be getting R211s from the base contract. The excess sets from the base contract can then head to the / until the option orders come in to fully replace the R46s on the / . Why can't we have modern plug-style doors that allow double the windows, instead of huge, opaque door pockets? Plug-type doors would only work here if the platforms were modified. It’s not worth the cost. R211 prelim assignments are and to start off. Everything else is pending. and are said to be in the planning as well. Logistics and final assignments could change based on the amount of options that are T models. and however are the originally planned lines, and this hasn’t changed yet. Only major changes are the accelerated delivery schedule that puts the first 10-car train here next summer, and now puts SIR last for delivery. Plug-type doors would only work here if the platforms were modified. Not if you design it correctly. Did the London Underground have to make any modifications for the plug doors on the S stock? Does anyone know? I don't know if they made the S stock slightly narrower to compensate but it doesn't look like the plug doors stick that far outward in this video. True. I just don’t see them deviating away from what we have now unless they modified platforms. 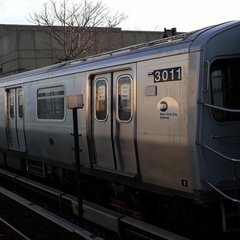 MTA is notorious for NOT liking plug-type doors of any kind on buses, subways or trains for a few reason. One is ease of maintenance, and self redundancy if the door fails. The particular side that fails will just remain closed. It’s parts are also commons with all NTT’s including the R211 and R262’s when it comes to the mechanics, thus saving on maintenance costs and parts stock drastically. The TA’s main concern is moving more passengers faster. The windows viewing range isn’t enough of a priority to invest in a whole new door design at this time, that would still have to be researched, developed, and tested. At least they’re giving (some) serious consideration to open gangway cars, a feature used successfully around the world. I really hope it will be a substantial portion of the R211 fleet (not just the 20 experimental cars currently planned for). I really hope it will be a substantial portion of the R211 fleet (not just the 20 experimental cars currently planned for). They seem to be assuming that the two test trains will be successful, and that the option order with a significant number of open gangway trains will be purchased. Additionally, the R262 slides mentioned incorporating features of the R211s into their design, with open gangways being a bullet point on that list. No dude, once the R211s arrive, the R32s and R42s will be retired almost immediately with the R46s going shortly soon afterwards. B. I said “for a period of time”. Meaning that for a short time, we might see 5-6 car classes on the and . Trains aren’t delivered and enter service all at once you know. WRT maintenance concerns specified in this thread, I don't know if the S stock is handled like this specifically, but generally rolling stock contracts in the UK and EU also contain maintenance, in addition to building the fleet. IMO the biggest beneficiaries of plug doors would be buses. At least on trains the doors don't do anything daft like opening inwards and reducing standing room in the vehicle. These editors ears will tell you that there are definitely similarities between the R143 and R179 inverters. Instead of rolling in the sound, the R179s inverters have harder transitions like ONIX. But the overall progression is the same while the pitch is higher. So I expect something similar when the R211 rolls around. Something different, but also the same in many aspects. The question is, by how much. The thing is the Bombardier trains are all using MITRAC, which is one of their widespread products. ONIX, however, doesn't seem to be produced by Alstom anymore, so it'll be interesting to see how a decade and a half makes a difference in terms of propulsion style. It was for comparisons sake since you can't really hear what I'm describing. When I talk bout hard/flat sounds, ONIX and the new MITRAC have that. Siemens and the older Adtranz/MITRAC inverters have rolling sounds.